Minister of Foreign Affairs, Mr. Joseph Malanji has said the transfer of technology from the developed world to Zambia was key in President Edgar Lungu’s foreign policy. Mr. Malanji said the Zambian government has decided to bring nuclear technology to Zambia as part of the overall plan to modernize and find homegrown solutions to the country’s economic and social challenges. The minister made the remarks during his recent visit to Moscow, Russia, following an invitation by his counterpart, Sergey Ravrov. During the visit, the Kwacha lawmaker visited Dubna where he toured a nuclear research center. “We had to visit the facility to deepen our appreciation of modern research activities in nuclear science which we are seeking for civilian purposes”, Mr. Malanji said. Zambia has signed an agreement with Rosatom, a Russian company to construct a nuclear research facility in the country. 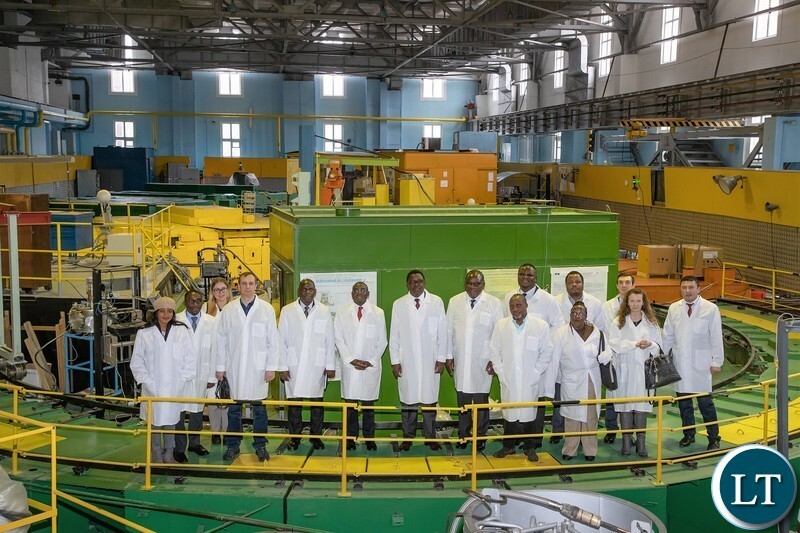 As part of efforts to be ready for the facility once completed, the Zambian government is seeking partnership with the Dubna-based research center to gain an understanding of how nuclear research works. So far, some Zambian government officials have been to Dubna as well as some experts in the nuclear field. Mr. Malanji is visiting as a top policy maker as part of Zambia’s efforts to underscore the importance attached to the program. 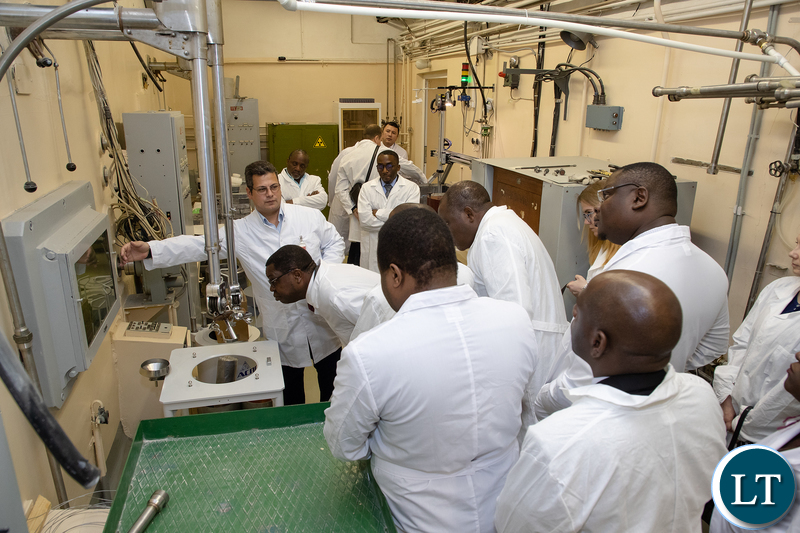 In order to ensure that not only nuclear technology is transferred, about 20 Zambian students are currently in Russia studying nuclear science at under graduate level. Upon graduation, the students are expected to form the backbone of the Zambian research facility. Once experts between Zambia and the Dubna research center work out the necessary technicalities, it is expected that Zambian experts will be regular visitors to the Russian facility. The research facility has signed agreements of cooperation with various governments around the world that include those in Europe, Africa and Asia. Zambia is seeking a formal agreement with the institution to formalize the relationship and benefit from what it has to offer. “Setting up a nuclear research center is not just an idea we are exploring, it’s a program the Zambian government has already agreed to proceed with”, Mr. Malanji said emphatically. The general public associates nuclear science with military purposes but the science has contributed to finding solutions to food production, clean drinking water, some forms of cancer, the production of electricity and many civilian problems. Once set up, the Zambian Nuclear Research facility will lead to the creation of scores of both specialized and non-specialized jobs. It is hoped that a new town will emerge around the facility to accommodate the center employees and their families. Mr. Malanji was accompanied to Moscow by Ambassador Lombe Chalwe, Permanent Secretary for International Relations and Cooperation and Industrial Development Corporation, IDC, Chief Executive Officer, Mateyo Kaluba. Zambia’s Ambassador to Russia Shadreck Luwita accompanied the Minister to Dubna to tour the nuclear research center. Isn’t this the same way Nitrogen Chemicals of Zambia was established? At this Moment we don’t need this we can collaborate with these research institutes we don’t need a research center here….Oh! I would be happy if you put up a center for Artificial Intelligence research & development and other ICT related, Car (EV) battery development (to utilize our cobalt and copper) … such things bambuli IMWE! lacking good sense or judgement; unwise. What Nuclear Research Centre, imwe please. In general, If this is meant to be a pure Research Centre for health purpose, then I am in support. I am also encouraged that there are 20 students currently studying who could possibly run the institution. Corruption or without, should not be the hindrance to development. Let’s fight PF “kolapsion”, and at the same time encourage progress and advancement. I think nuclear research is doable in Zambia. Please, this is not for ECL, think of 10 -30 years from now. According to up and sound fools. You cannot even test the efficacy of Sondashi formula in Zambia …you have had to send samples to South Africa and u think a nuclear research center is your priority ????? Jokers of the worst kind, look at them with posture of how they can corruptly steal money from technology they neither understand nor capacity to understand. Does Zambia need Nuclear Energy, if so can someone please explain we need it. In my opinion Zambia is rich with less risk free energy sources which in my opinion should be given priority. I do not want to see a Chernobyl disaster in Zambia. It is a nuclear research unit NOT a nuclear reactor for energy production. Try to read a little bit first. Cancer treatment using nuclear isotopes can cost a min of $10,000 per patient..
Now if you need to treat 500 patients per year that is a massive cost importing…. Kangwa – Rosatom has built many reactors in a number of countries. Tell me where in these countries is Russia dumping nuclear waste. Also, you do not seem to know that it is not possible to dump/hide nuclear waste anywhere in the world. For further learning and just a bit of your understanding, refer to Spaka at 3.4. Mr shameless,UPND has made guys to be the worst worshipers of HH. You oppose everything that the government is doing just because you’re opposition.Your DNA of bitterness and hatred is now a pandemic. Car (EV) battery development… such things bambuli IMWE! Shameless – Before you mislead many of your worshipers – try to do a bit of research on what this project is all about and what it is intended to achieve. You seem to be completely lost but really want to write something on a topic you are very ignorant of. I hope you know that South Africa already has a mature nuclear program and already has a research nuclear reactor. So what’s your point ????? Why can’t we use what they have developed from their research. I don’t need to be an expert in a topic to understand the principal that necessitates the need for research. I have challenged you to justify why u need this research center in light of our current and immediate future needs??? Mubilima chabe zoona imwe ….this is a research facility look at how Europe coordinates these things and u will learn a thing or two they don’t replicate some of these things in every country a hospital is a totally different thing from a hospital. Almost all things you enjoy manufactured or otherwise are things developed from research in other countries including the bl00dy gadget u are using….. And that is my point iPhone doesn’t need to have R&D for OLED screens because LG or Samsung already makes the best so just buy from them and still end up with a better or more profitable phone than either….I hope you catch my drift. Your argument ba abilima is worrying and flawed. Looking at who is talking, it is obviously a waste of resources. First we need to solve the food problem. Otherwise forget it. Be aware and differentiate between Nuclear centre for energy purposes and nuclear research centre for health purposes. Those are completely different if handled correctly and not the way IRAN makes the world believe. So don’t go IRAN way. Zambia cannot manage water drains, if this is a reactor will we manage a spill? You have already 20 people studying Nuclear, don’t you think they will have sufficient to run it? Wait until Israel comes to bomb it. Ask Iraq and syria. PF is dry of ideas. Why should Isreal bomb it, if they have not bombed the SA one? Is Zambia Iraq or Syria? Which SA one? SA does not have a nuclear power plant. Just to update you that they dropped those ill-informed Zuma ideas of nuclear which the blind PF are still foolishly pursuing. Please keep abreast lest you become like PF also. The lord commands in the Bible that a homosexual be put to death.Peter Carlos Hinds. The old story that money should be taken out of technology and put into agriculture.But many things in agriculture depend on technology.You have to plough the land.Technology needed.You have to irrigate the land.Technology needed.You have got to transport produce to consumers.Technology needed.The cooking of food.Technology needed.Etc.Peter Carlos Hinds. Radioactive waste for the next 10,000 years? Sure! GM-cotton? Absolutely not, too dangerous! After 10,000 years it will have stabilized to be re-used. A neighbouring country s ex president tried this nuclear plant corrupt scheme, and failed. Alert citizens saw through the gimmick and shot it down. Surprised too see it resurface here. Google it. If you mean SA , they stoped a nuclear power plant for electric production, but also SA have a nuclear research centre for medical and other sciences …..
You can’t manage regular household waste leading to deadly cholera deaths yet you think you gonna manage nuclear waste ? PF are serious jokers . How ready and resource confident are we to handle nuclear waste?It is Disappointing to hear the likes of brother BR Mumba who have been to Germany say ” lets roll ” when you may have heard or witnessed a better off economically standing country like German struggling with nuclear waste.Lets be realistic.Why are we so evil and haste in making such descisions with far reaching consequences taking advantage of the ignorant majority of our own people?Does even 20% know what is involved?Such greed! It’s Sergey Lavrov and not Sergey Ravrov.